Nine years ago, senior Jin-ji died in the school’s art room. Since then the building it’s part of has become storage, abandoned amidst rumors of a haunting. The main plot deals with standard business, such as an increased body count and the effort to uncover past events. There’s some good stuff in there, but it’s well-trod ground with nothing new in it for horror fans. The reason I adore this movie is that it’s really a solid school drama with horror trappings. Room 3’s new teacher makes sure that the students pay attention to his introduction. The strength of the movie is that the B-plot is compelling and complements the story perfectly. The top two students in class 3 are So-young (Jin-hee Park) and Jung-sook (Ji-hye Yun). They used to be friends, but the teachers at this school encourage competition and explicitly advised So-young to turn on Jung-sook for the sake of her own grades. This turns out to be precisely what happened to Jin-ji shortly before her death. The friend who turned on her is none other than Eun-young Heo (Mi-yeon Lee), who has returned to teach at the school. Is this what set off Jin-ji’s murder spree? So-young and Jung-sook have a tense conversation in the old art room. Well, no. Miss Heo’s presence is one of those rare red herrings that adds to the depth of a story instead of serving solely as a distraction. In fact she’s integral to the story, providing support for the actual lead. Who’s that? Senior Ji-oh (Gyu-ri Kim) a student with a reputation for spirit channeling and penchant for art. It’s she who discovers the first body, and when her painting of the scene gets her banned from the new art room, she relocates to the abandoned building — which happens to be where So-young hides from the pressure. 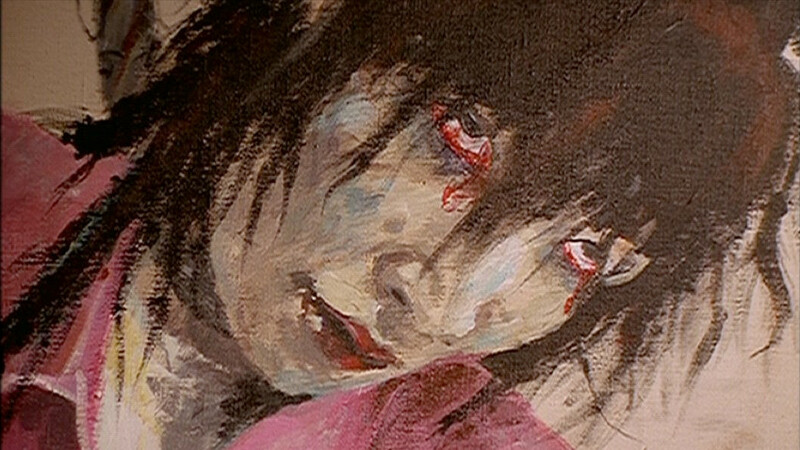 Ji-oh’s painting of Miss Park. It’s really satisfying to see a genre film pull everything together the way this one does. Although it has a lot of narrative throughlines, everything serves the story and nothing feels superfluous. If there’s one weak point, it’s that the revelation of how Jin-ji died plays out like a fatal Rube Goldberg cartoon. It’s a preposterous accident that would be more suited to a Final Destination sequel. One unfortunate moment won’t wreck an otherwise good movie for me, but be advised that the ultimate truth of the ghost’s origin is not the high point of the film. Jim-ji appears to strike at a teacher. I like a good ghost story. Okay, I like a bad one too, if it’s fun enough. Yeogo Goedam is a fair ghost story, but it’s more about the cycle of abuse fostered by the school’s approach to academic excellence. It’s a tale of the human cost to meaningless achievement that happens to include ghosts. It also raises hope for the future while stressing that the cycle is still far from broken. More than anything, I love a cheerfully depressing ending, especially one that’s earned.